Smart Engineering Simulation Apps | ESRD | Engineering Software Research and Development, Inc.
Smart Engineering Simulation Apps (SESA or Sim Apps) are a revolutionary breakthrough in the ability to standardize and automate recurring analysis tasks and simulation workflows, using FEA as a solver engine. 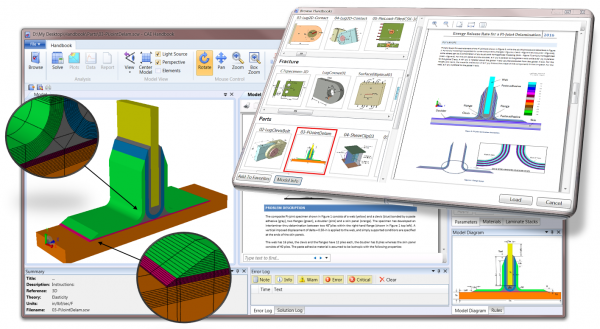 Simple and elegant FEA-powered templates providing verified solutions for specific engineering applications. Sim Apps are finite element analysis (FEA)-based CAE software tools that standardize and automate recurring analysis tasks and simulation workflows. Sim Apps are designed to fit into existing or reimagined processes that capture design rules, best practices, and institutional knowledge of the user’s organization and industry while encapsulating complexity and technical risk. Sim Apps are created by experienced simulation analysts for use by designers and engineers who may not have the expertise required to efficiently or reliably perform FEA. Sim Apps are “smart” if they satisfy the requirement of Simulation Governance and automatically provide users of any experience level with an explicit measurement of analytical quality through solution verification. To understand the role of Simulation Governance in accelerating the adoption of Sim Apps read this Comet Solutions blog article by ESRD President and CEO Dr. Ricardo Actis. What are the benefits of using Sim Apps? Of the nearly 2 million engineers in the US, with over 250,000 mechanical engineers and designers, it is estimated that about 10% of those are routinely using simulation software. Far fewer of these would be considered expert simulation specialists. The use of Sim Apps enables simulation-driven design and the democratization of simulation by allowing many more designers and engineers to routinely access the value of simulation technologies with confidence and reliability. For the simulation specialist, Sim Apps make difficult classes of problems easier, faster, and more accurate to tackle to support the ever-increasing performance and complexity of products including their design, manufacture, test, use, and repair. Sim Apps makes routine design analysis decisions solvable by the designer / engineer as they once did when using conventional handbooks or design curves for less challenging designs. Sim Apps empowers the new engineer or project team member to be productive sooner with access to reliable tools that have captured the institutional knowledge, standards, and best practices of their organization. What are the challenges with creating/using Sim Apps? Existing simulation technologies based on traditional finite element implementations are problematic when used as the “engine” behind Sim Apps. The numerous reasons that traditional FEA software is not used routinely by design engineers are the same obstacles that make them largely unsuitable for use in Sim Apps. The inherent complexity and expertise required to ensure that modeling assumptions, meshing rules, element selection and extraction of results are consistent, combined with the inability to measure or control solution quality, is often an insurmountable challenge for production use. To learn more why this is so, download the NAFEMS America 2016 paper by ESRD and view the NAFEMS webinar on “Simulation Governance: Technical Requirements”. From a business perspective, given the amount of effort to create a traditional finite element model that is simple and robust enough for casting into a Sim App, then post-processing results with confidence, it is no surprise that the financial ROI is often weak. Fortunately, a new generation of numerical simulation technology is now available which has proven to be far easier and more reliable to use for powering Smart Sim Apps. What are ESRD's technology and product offerings for Sim Apps? ESRD’s numerical simulation technology base allows the creation of Sim Apps that are far more simple, efficient, robust, and reliable to create and use when compared to those created on-top of legacy finite element software. The implementation is based on a hierarchic modeling framework and hierarchic finite elements spaces with an extremely simple element library enabling the same mesh to support all analyses types. High resolution solutions are obtained from low density meshes and an unmatched post-processing capability provides objective measures of solution quality for any function of interest, anywhere in the model, and at anytime. Only finite element implementations designed to support verification and validation procedures can enable the practice of Simulation Governance required for Smart Sim Apps. Otherwise, to pretend to hide the complexities of finite element meshing without providing the non-expert user with an explicit measurement of solution quality is reckless. To learn more why this is so download the new ESRD whitepaper “Technical Requirements of Smart Engineering Sim Apps”. What are some examples of Sim Apps? ESRD has been creating custom Sim Apps, like this one for 3D crack simulation, through contracts with the Aerospace & Defense industry for well over a decade.